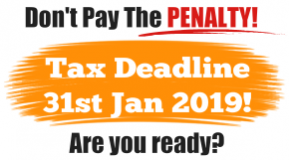 If HM Revenue & Customs have issued a notice for you to submit a Self Assessment Tax Return for the year to 5th April 2018, you must act before 31st January 2019 or they will issue a late filing penalty. This is where Alexander Accountancy can help, with experience of completing tax returns for individuals, sole traders, partnerships, pensions, trusts etc. Alexander Accountancy has a team of staff to help you and have the capacity to act before the deadline so you won’t have to pay any penalties. And remember with the festive season now over, the end of January will arrive quicker than you think. Need accounts preparing to produce the figures for your tax return? Self employed and not sure what to claim? Do you receive cash payments or untaxed casual income? New to Self Assessment and not sure what to do? Need to declare income but not yet registered? REMEMBER if you have been asked to submit a tax return, even if you have nothing to declare and no tax to pay, you still need to submit the tax return or advise HM Revenue & Customs you have nothing to report and ask for the notice to submit a return to be cancelled.